After years of underuse, many of Ireland’s pilgrim paths are being reopened. In our secular western world, why do people still embark on such journeys? After generations of slumber, many of the pilgrim paths of Ireland are reawakening. Some of Europe’s oldest penitential walkways – most reaching back to pre-Christian times and, therefore, long predating the relatively youthful Camino de Santiago, in Spain – are again echoing to pilgrim footfall. The first stirring in Ireland’s modern pilgrim era came when the Tochar Phadraig was reopened in 1987. This prehistoric chariot road from the royal palace at Rahcruchan to Croagh Patrick was Christianised as a penitential path around the time of St Patrick and then became a popular penitential walkway. Frank Fahey, curate at Ballintubber Abbey, in Co Mayo, and a driving force behind the reawakening of the Tochar, has seen a big increase in the numbers walking the route. The abbey keeps a record of Tochar pilgrims, and this year was the first time that numbers exceeded 1,000. “In the beginning we just had local people,” says Fr Fahey, “but now, with the great expansion of pilgrim walking, the Tochar has become much more popular. Most days this summer we had groups or individuals setting out from the abbey to walk to Croagh Patrick. 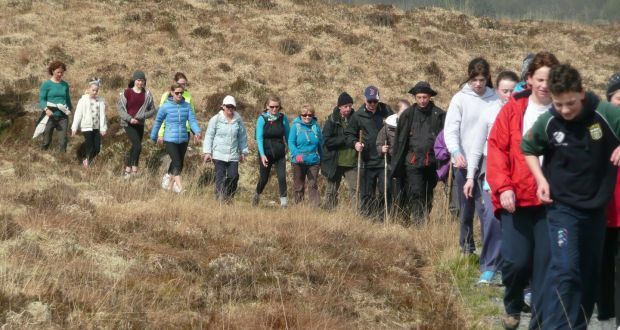 With heritage and our environment now increasingly important issues, Fr Fahey believes that pilgrimage brings us closer to understanding both, as witnessed by the growing popularity of Irish and European pilgrim paths. He now hopes that an interpretive centre can be established at Ballintubber Abbey based on the theme of European pilgrimage. “Ireland was an important centre for pilgrimage in the early Christian period. We had people from across Europe coming to centres of learning like Clonmacnoise and Glendalough, while saints such as Columbanus and Gall went in the opposite direction to spread the gospel. David Ross has recently returned from leading a group of 32 pilgrims on a contemplative journey following St Finbarr’s Way in west Cork. Local tradition holds that the patron saint of Co Cork journeyed back to Gougane Barra along this route after exhorting the people of Drimoleague to return to Christ. But, with so many outdoor experiences now available, what is the special allure of this route? “One attraction,” says Ross “is that it is a two-day walk, allowing plenty of time for reflection and contemplation while, at the same time, it is possible to complete it in a weekend. Waterford’s patron saint also seems set to claim his inheritance. Regarded by many historians as predating St Patrick as an Irish missionary, St Declan of Ardmore is, nonetheless, little known outside his native county. Similarly, the ancient path across the Knockmealdown mountains that Declan walked on his journeys from Ardmore to Cashel was almost forgotten. Now the efforts of a local man, Kevin O’Donnell, to restore the route, which incorporates the historic Rian Bó Phadraig and a necklace of other historic sites, seems about to pay off. Plans are afoot to map and waymark the entire 94km path, and a steering committee representing interested community groups, and supported by the local authorities and Leader companies in Tipperary and Waterford, has been put in place to manage the project. “This pilgrim path has the potential to be a huge success. We have already organised two walks on the route, to celebrate National Pilgrim Paths Day, and on each occasion we attracted over 200 participants. The length of the route is a major attraction, since its distance is comparable to the final stage of the Spanish Camino,” O’Donnell says. See this article here in the Irish Times.